One of the prayers that Luis and his Christian brothers uttered the night he lost his business was for God to protect their hearts from resentment. Even in the midst of persecution, he was desperate to not hold a grudge toward his neighbors. Leading up to the Summit, BillyGraham.org will be sharing stories from Christ followers persecuted for their decision to follow Jesus. Mexico is ranked 41st among the top 50 countries most hostile to Christians. All names have been changed in this story to protect identities. Maria's father was a violent drunk. But one day, he accepted Jesus Christ as his Savior, and everything changed. His family rejoiced; they found Christ, too. His community in Chiapas, Mexico, was less pleased. Armed with pistols, machetes, sticks, whatever they could grab really, peopled formed an angry mob and stormed his home at dinnertime. The bloody, deadly conclusion that followed is not an isolated incident in this otherwise picturesque southern Mexico state dotted with archaeological ruins. The ancient reminders are merely a visual representation of a blended, archaic culture that still dominates the area. Indigenous leaders, or chiefs, essentially govern these communities on the basis of pagan religious traditions, despite a valid Mexico constitution that guarantees freedom of religion and calls for the separation of church and state. The reality is, there are certain challenges when it comes to enforcing a piece of paper in a remote part of the country so fiercely committed to its customs. Jorge knows those challenges. 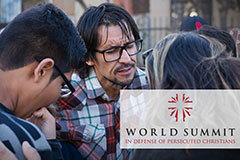 A pastor-turned-lawyer, he is one of the few sources of legal defense for persecuted Christians in this area. It's a poor-paying, dangerous job replete with threats on his life and the well-being of his family. That might come as a shock since this North American country reports Christianity as its main religion, but there is another statistic to consider. This year, Mexico climbed one spot to 41st on Open Doors' World Watch List that measures the persecution of Christians by country. During his time as a pastor, Jorge was presented with many horrifying stories from his Christian brothers and sisters, and that prompted him to pray a little differently. He asked God to open doors, if it was His will, so he could train to become a lawyer. Today, Jorge actively defends Christians in the wake of serious affliction. "It touched me very hard, to the extent that I could not remain silent," Jorge said. "If I could help my brothers in any way, it was worth it. Because having legal tools and being able to defend and not to help would be like being an accomplice of the caciques." Caciques is another name locals use for the leaders who oversee the pagan practices. Their livelihood is directly tied to the community's participation in the 20-some annual festivals that incorporate mass quantities of alcohol alongside fireworks and animal sacrifices as a way of worship. So when a violent drunk like Maria's father calms down, neighbors notice. When the family skips the festivals, the leaders not only find out, but their pocketbooks can take a hit, some locals say. As a result, persecution picks up in these already impoverished communities. Threats are issued. Water is cut off. Businesses are destroyed. Houses are burned, sometimes with people in them. Torture is another common method as heads are scalped and feet are scraped. Converts are jailed, exiled and sometimes even killed—all because they've trusted in Jesus Christ. "The persecution here in Chiapas has reached a maximum degree," Jorge said, adding he is impressed by the resolve of Christians to not renounce Christ in the face of such violence. "Here in the upper region of Chiapas we have many heroes of faith." Choosing Christ cost Luis his business. He remembers the night an angry mob descended on the property after months of threats. He was standing with other believers in a house nearby, praying continually as people from his very neighborhood spent 11 hours smashing his water supply and ultimately his livelihood. "They wanted us to return to their lives, to their traditions," he said. "But we have been strengthened by the Lord, and we are constantly fighting day-by-day asking the Lord God to give us strength to go forward." Rosa asks for that same strength. A young mother of nine, she was exiled from her home several years ago. Her husband sobered up once he got into the Word of God and in 2009, she too, accepted Christ. Her family now lives in a shelter in San Juan Cristobal, a tourist city in Chiapas, after her neighbors and former friends destroyed her home. They once attempted to return home, but persecutors intercepted them. The Christians were blindfolded, beaten. Some were non-fatally hung from a tree and doused in gasoline. Returning home is unlikely, and Rosa knows that as her family scrounges daily for food and other essentials. But Jorge is working on her case, and Rosa centers her faith squarely on the Lord. She clings to Jeremiah 33:3. "God has not abandoned us," she said. "He will always be with us…"